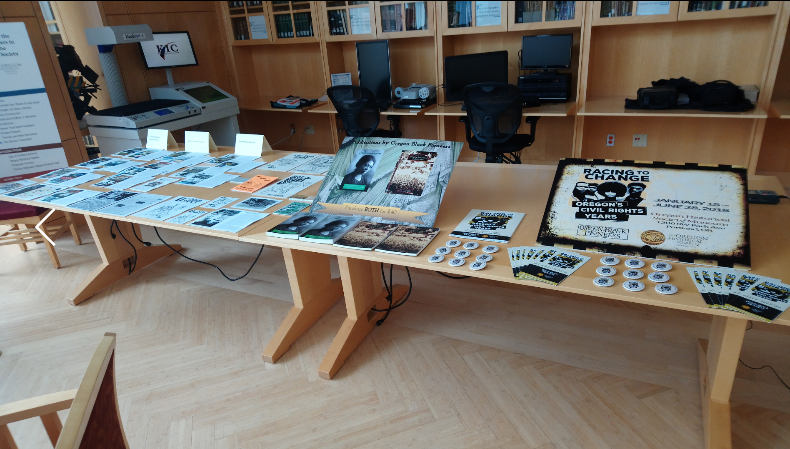 The event was presented by the Oregon Black Pioneers (OBP) in collaboration with the OSU Libraries and Press. The OBP is an all volunteer nonprofit organization based in Salem, Oregon. It was founded in the early 1990s to do research and educate Oregonians about African-Americans’ contributions to Oregon’s history. For the past several years the Oregon Black Pioneers has collaborated with the Oregon Historical Society in Portland to curate a number of exhibition’s showcasing Oregon’s African American histories. The most recent exhibit Racing to Change: Oregon’s Civil Rights Years illuminates the Civil Rights Movement in Oregon in the 1960s and 1970s. The exhibit is on view at the Oregon Historical Society until the end of June. As part of the Racing to Change public programming series, the OBP has had a number of speakers talking about their first hand experiences, so for this event, the organization wanted to host an event that featured the individuals behind the scenes, the keepers of history – archivists – to talk about history. Each of the panelists respective universities hold archival records that document the student activism that occurred on their campuses during the 1960s and 1970s. 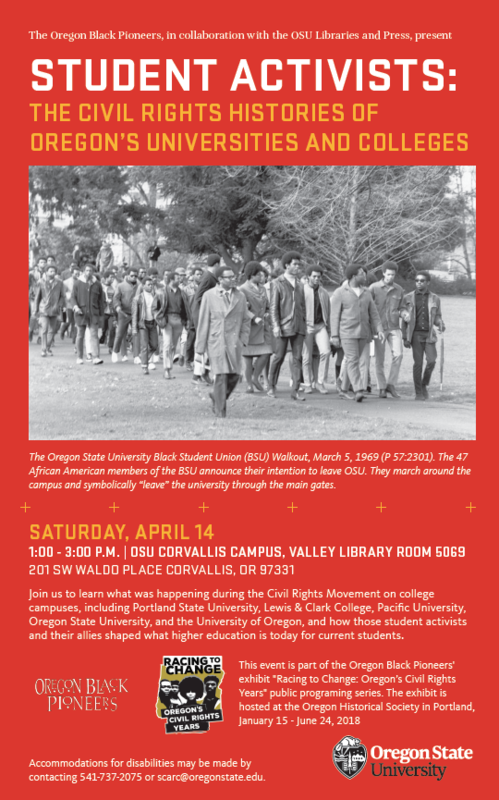 Event Summary: The panelists at this event discussed student activists and the civil rights histories of Oregon’s universities and colleges. The four panelists featured in this discussion shared their archival expertise regarding the history of student activism and civil rights at their campus. The histories of colleges and universities presented included: University of Oregon (a brief history presented by the moderator), followed by Oregon State University, Lewis and Clark College, Pacific University, and Portland State University. After the panelists were finished with their presentations, the event progressed into a Q&A and open community dialogue format during which community members were also able to share their personal experiences. Hannah Leah Crummé, worked at The National Archives of the UK before joining the Watzek Library at Lewis and Clark College in Portland as the head of special collections and college archives. She received her BA from Pomona College in Claremont, California and completed her doctoral research at King’s College, London. Eva Guggemos has been the Archivist at Pacific University in Forest Grove since 2011. She previously worked at the Beinecke Rare Book & Manuscript Library at Yale University. She has an MLS from Simmons School of Library and Information Science, an MA in History from Yale University, and a BA from the University of Kansas. Cristine Paschild has been the Head of Special Collections and the University Archivist at Portland State University Library since 2008. Before joining Portland State, she spent seven years with the Japanese American National Museum in Los Angeles as an archivist and the director of the collections management and access unit. Paschild holds an M.A. in English and an M.L.I.S. with an archives specialization, both from the University of Michigan, Ann Arbor. Natalia Fernández, is an associate professor and the Curator and Archivist of the Oregon Multicultural Archives (OMA) and the OSU Queer Archives (OSQA) here at the Oregon State University Special Collections and Archives Research Center. Fernandez is a board member on the Oregon Black Pioneers’ Board of Directors, and served on the Racing to Change exhibit advisory committee.